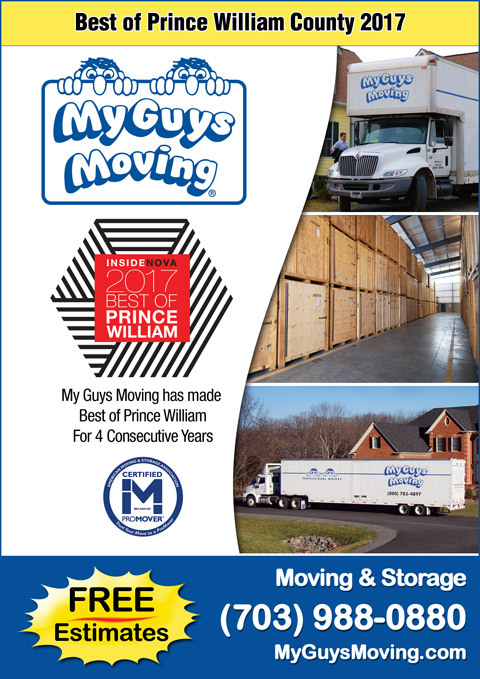 Almost 90,000 votes from 8,500 different voters were cast in nearly 200 categories, and the results are in… My Guys Moving & Storage was voted one of the best moving companies in Prince William County for the fourth year in a row! From the best spots for romantic dining to the best yoga studio (there wasn’t a “zoo” category this year), from the best real estate agent to the worst traffic hazard, the survey provides a valuable guide to excellence in Prince William County. For a complete list of all the businesses that won the Best of Prince William 2017, visit the publication’s website. Even though we came in as Runner Up this year, our moving specialists continue to enjoy sharing money-saving moving tips and to offer the most dependable and affordable moving service in Washington DC Metro area. Remember to ask about our free used box program when getting a free estimate on your home or office move. Thanks to everyone for voting My Guys Moving & Storage as one of the best moving companies in Northern Virginia. For previous years’ awards, see 2014, 2015 and 2016.